A family is out for a day of snowmobiling and they take a break for lunch in a wide open basin on the West Fork of the Duchesne. Four young family members walk to the edge of what appears to be a packed trail, however the edge is a cornice. 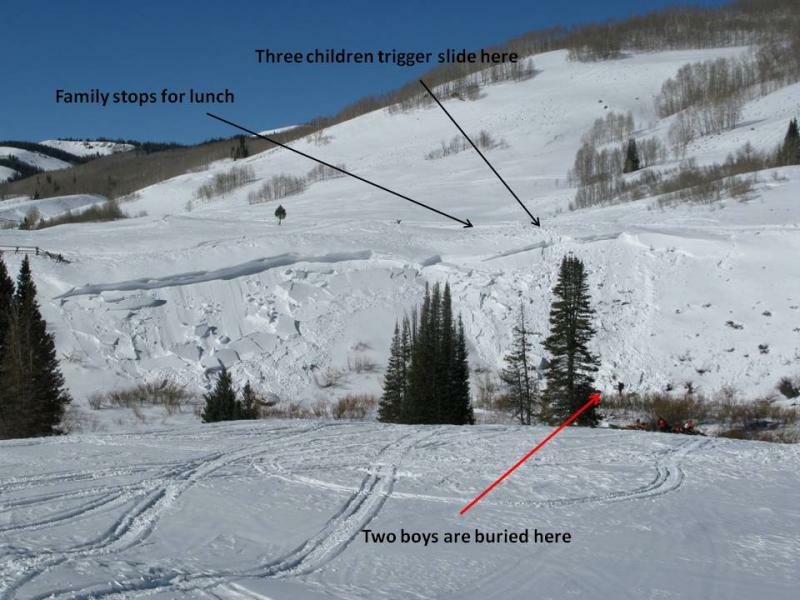 They collapse the slope and two boys ages 7 and 14 are caught, carried, and subsequently buried at the bottom of the slope. 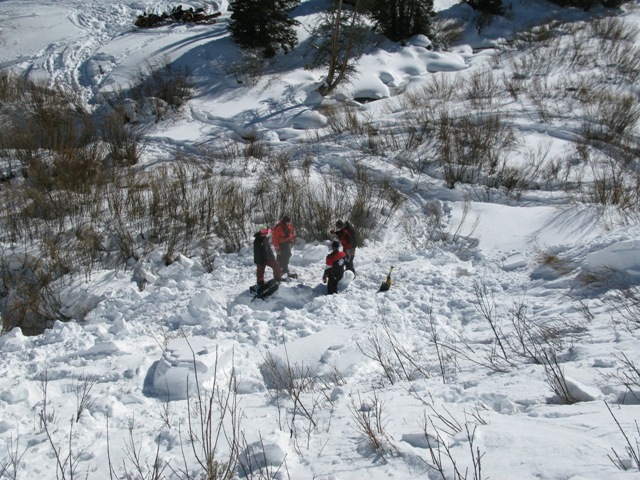 While the father looks for the two boys, the mother jumps on her snowmobile and heads towards the trailhead to find help. She runs into State Parks grooming personnel who then activates 911. Wasatch and Summit County S&R along with two medical helicopters are dispatched. The small avalanche path is difficult to locate, but when the medical helicopters land, they discover the father performing CPR on both of his sons. The two boys are flown from the scene and pass away later in the evening at the hospital. Many thanks to all the heroic efforts put forth by Wasatch and Summit County Search and Rescue along with State Parks and Air Med personnel. Short and moderately steep, this isn't a big, radical slope. However, the wide open, flat basin provided the perfect environment for recent swirling winds to form a very cohesive slab. The western Uinta snowpack is about as Continental as it gets for a range located in Utah. Cold temperatures, high elevation terrain, and shallow snow depths are the norm for the range. We often see deep instabilities linger late in the season. The early portion of the winter started with a promising storm track and relatively warm temperatures. 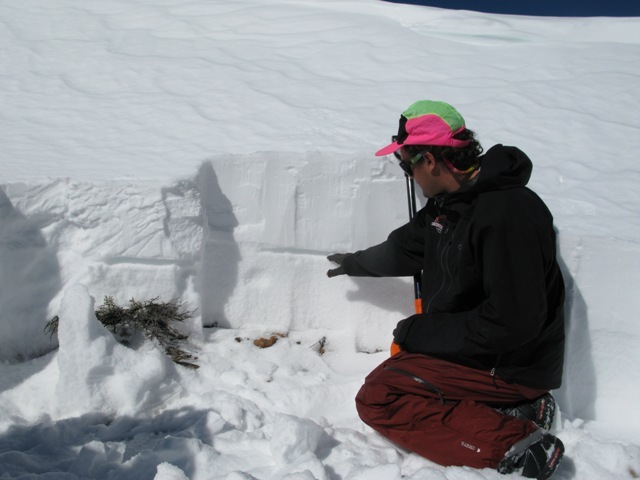 While the region experienced a large natural and remotely triggered avalanche cycle the week of Dec. 17th, in general avalanche activity has remained unusually predictable and the snowpack has been relatively strong. Very cold temperatures filtered into the region on January 11th, lasting to the 15th. Overnight lows reaching to -25 degrees were common in low laying basins with terrain features similar to the West Fork of the Duchesne. 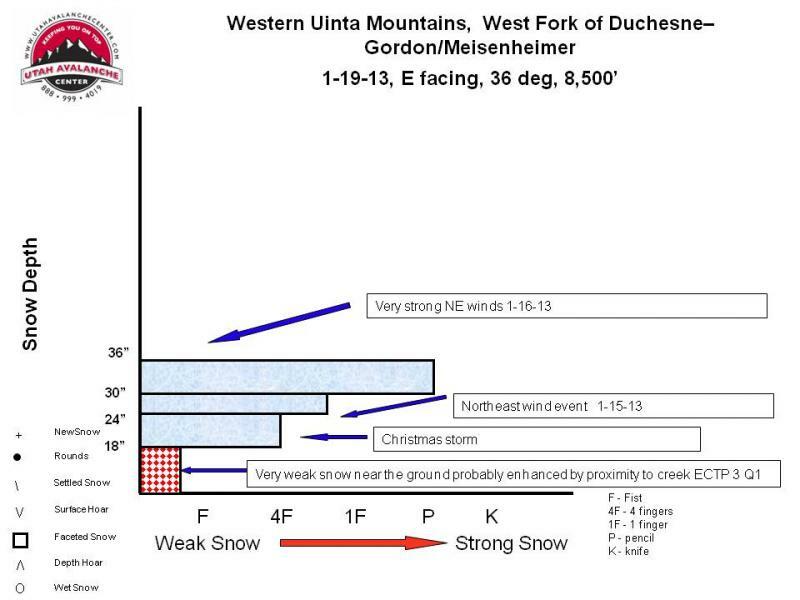 During this time about a foot of very light density snow fell. Jan. 14-17 brought very strong Northeast winds to the region. Averaging 30-40 mph with gusts into the 60's and 70's, winds channeled through this basin, forming very dense slabs in unusual locations. 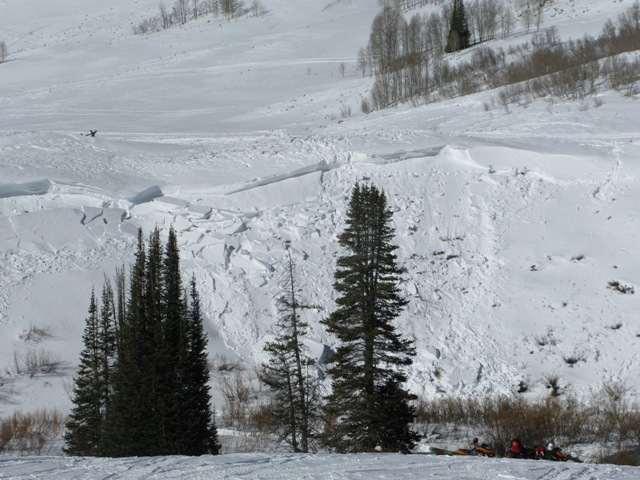 The Utah Avalanche Center updates the western Uinta advisory program Wednesday, Saturday, Sunday and during times of heightened avalanche danger or when a watch or warning is issued. The danger was rated as Moderate for Wednesday Jan 16th and changing weather was not a factor in this accident. 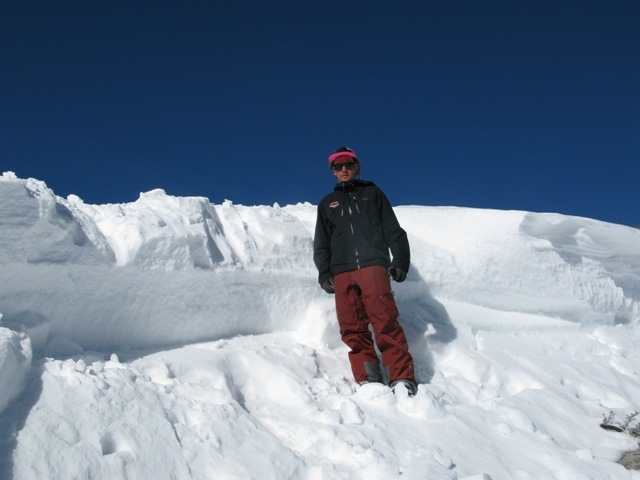 "Northerly winds have been brutal along the high ridges and they're having no problem whipping all the fresh new snow into stiff wind drifts. Today you'll find these chalky looking, hollow sounding slabs along the leeward side of mid and upper elevation ridges. They're most prevalent on slopes facing the south half of the compass, but I suspect you'll find a fresh drift or two cross-loaded in upper elevation chutes and gullies as well. In either case, todays slabs will break a bit wider and deeper than you might expect."